How detailed should your trading plan be? There is of course no right answer apart from whatever works best for you. Some people need detail – lots of it. Others will never need more than a single page, with anything longer simply gathering electronic dust as it sits unread on your hard-drive. You need to create both! Well, firstly, even if all you want is a small summary plan, then you can’t properly write that unless the detailed one is produced first. To be effective, a small plan must summarise the key components of a thorough and detailed plan. But there is a deeper reason as well… the process of producing both versions will provide you with increased clarity regarding both how you trade and why your plan should work. Produce a large and detailed plan because the process of getting every aspect of your trading business onto paper will ensure a thorough and detailed knowledge of your business operations; increasing likelihood of considered and pre-planned actions rather than emotional and unplanned reaction to price movement. It doesn’t matter if you don’t refer to it again, preferring to use your summary version. It’s the process that is important. Produce a single page summary because the process of simplification helps cement in your mind a deeper understanding of the key aspects of your plan. It doesn’t matter if you prefer to work from a detailed plan in future; again, it’s the process that is valuable. 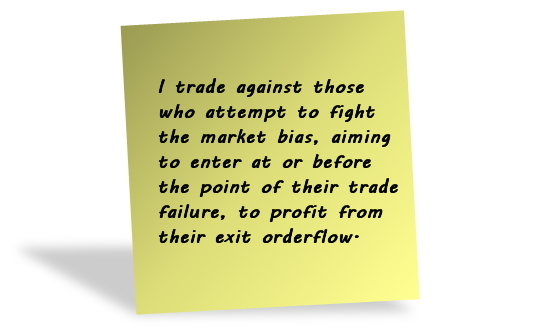 You need to be able to define your whole trading approach in one short paragraph; something that fits on a Post-It Note*. It creates a perfect summary reminder that can sit attached to your monitor, to keep you on the right path. But more importantly, as before, the process of doing this should provide a deeper level of understanding as to exactly how you’re trading. To reduce it to a single paragraph, I want you to go to a higher conceptual level – not just what you’re doing, but why. If you can’t do this, and fit it on a Post-It Note, I’d suggest you need more work on your trading plan; particularly in understanding why your plan should work. So… get a Post-It Note. And get writing!